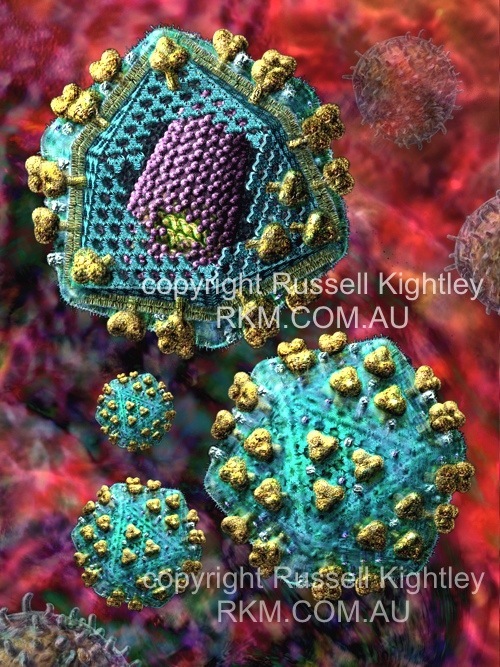 Illustration of a group of HIV/AIDS virus particles. The above image is 400 pixels across, the original measures 2200 pixels across. Human Immunodeficiency Virus (HIV or AIDS virus): this illustration shows the internal structure of the virion (upper particle). The virus is coated (enveloped) in host cell membrane, which is drawn as a bluish green semi transparent layer in which various membrane proteins can be seen floating. Where the envelope has been cut (greenish yellow striated layer) the phospholipid molecules can be clearly seen. Beneath the viral envelope lies the matrix. The matrix proteins (MA p17gag) are drawn as trimers (bluish "Y" shaped structures) that form an icosahedral molecular cage (please see separate matrix shell picture. The viral knobs (golden projections at the viral surface) insert into the matrix. These knobs allow the virus to attach to cells. Inside the matrix shell is the conical core, drawn as a purple bullet shaped structure. Part of the core is cut away to reveal the contained genetic material (yellow).